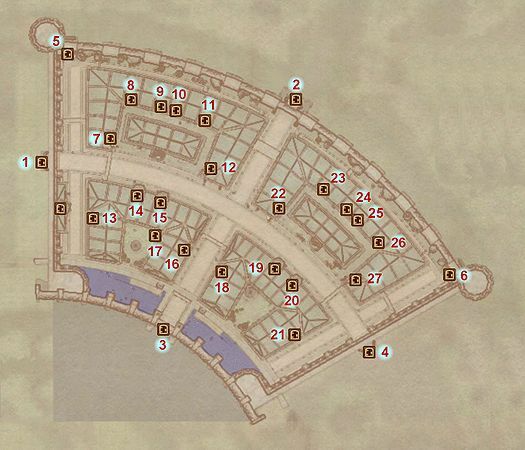 The Market District is a portion of the Imperial City where various goods can be bought and sold. To find a particular place, check the relevant number on the map. One in the Mystic Emporium "Private Quarters". One in The Gilded Carafe. According to the Oblivion Official Game Guide, the western statue is "Uriel Septim III: Commemorating Uriel III's victory in the War of the Red Diamond", and the southeastern one is "Pelagius IV: Son of Tiber Septim". Since Uriel III actually lost the War of the Red Diamond, and Pelagius IV was the grandson of Uriel Septim V, not Tiber's son, this information may not be correct. Esta página foi modificada pela última vez à(s) 05h15min de 13 de janeiro de 2013.